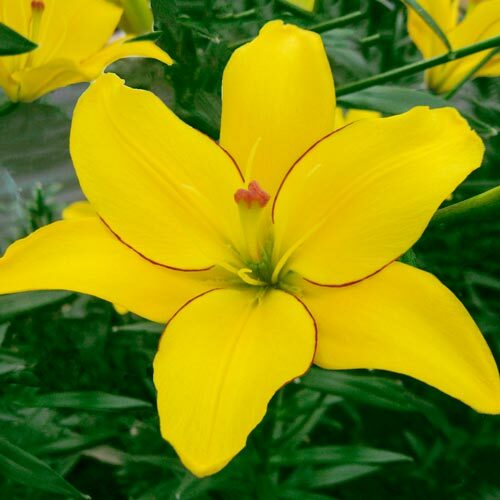 Asiatic Lily with yellow petals edged with maroon. Ht: 30-34". 4-5" flowers. 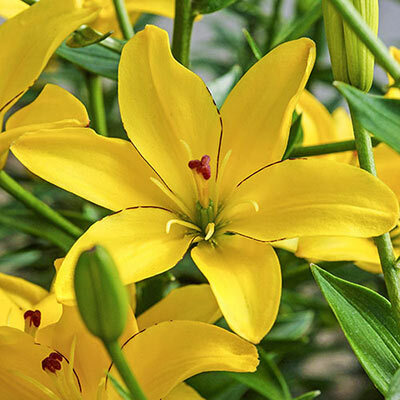 Bold, colorful and fragrant, lilies are treasured in the garden and fresh floral bouquets. They multiply annually, giving you more blooms every year. Cold hardy perennials, they can stay in the ground over winter. Just allow leaves to yellow in the fall before removing them. These gorgeous lilies are ideal for landscapes or containers. Plant them wherever you would like to make a bold and exotic statement. 4-5" Upfacing, trumpet flower. Typical asiatic form.